Andrews McMeel Publishing’s senior art director talks about the company’s design ethic and philosophy, and her own approach to creating innovative book design. The Andrews McMeel Publishing Book Group publishes gift books, children’s books, cookbooks, general trade, cartoon, coloring books, and puzzles and games. The cookbooks are the most design-heavy but, as in life, that which is the most challenging is also the most rewarding. Our books are best known for creative content in a quality package. Each book has its own look and feel to reflect the content and to appeal to the target consumer. Our books are identifiable by the quality of production values and thoughtful consideration of their design. The books with the most innovative packaging are the Posh® puzzle books. We use flocking, foil stamping, embossing, glitter, and uncoated stocks to ensure they are a distinct package and feel good in your hands. My title is senior art director, book division. My 20th anniversary with the company is this December. I work on every type of book we publish, yet am probably most associated with working on covers for the Posh® puzzle line, and now Posh® coloring books. In 2008, we released a few high-end puzzle books for women featuring pretty patterns with tactile printing techniques, based on the success of a calendar we had sold the previous year. The puzzle books exploded in popularity—more than 7 million books have been sold. We have now extended the Posh® brand to a line of very successful coloring books. In 2010, we published Run Like a Mother, and I was assigned to the title; I was the target demographic. At the time, I had a one-year-old and a three-year-old, and ran for sanity’s sake. 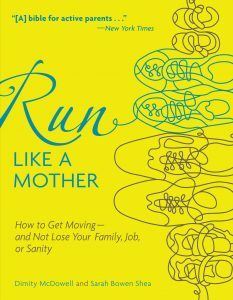 I needed to convey that this book was for a mom who ran, but not necessarily show a woman running behind a baby stroller. Using a photograph is sometimes not a good option, as it can potentially limit the target audience to a certain age or ethnicity. Julie Barnes couldn’t find stock photos or illustrations she liked, so she took a pair of shoes from everyone in her family and photographed them. She traced the outline of the shoes, added the type, and presented the concept at a jacket meeting. Everyone loved it, so Julie illustrated the shoes for the RUN LIKE A MOTHER cover herself. To address this challenge, I had the idea of showing shoes, but I couldn’t find any stock images or illustrations that were suitable and aligned to what I had in mind. I was going to have to commission the art, but I had to sell the idea. So I took a pair of shoes from everyone in my family, lined them up, stood on a chair, and photographed them. I traced the outline of the shoes, added the type, and presented the concept at a jacket meeting. Everyone liked the idea, and I was encouraged to illustrate the shoes myself. Thankfully, the authors loved the cover once it was final, and we went on to publish two additional books in the series, Train Like a Mother and Tales from Another Mother Runner, with covers that complemented the design. For the second and third books, I commissioned the art. The team wanted the cover of STEEPED to look like a tea tin. The challenge was to have it quickly read as a cookbook. 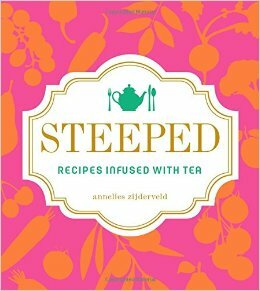 Another challenging book cover was for Steeped: Recipes Infused with Tea, a cookbook with recipes infused with tea. The author and editor were very involved in the look of this book. The author sent me a Pinterest board of illustrations, fonts, and colors she liked, and the editor sent me a photo of a dress that was pink, orange, and gold. The thought was to have the book look like a tea tin. The challenge was to have it quickly read as a cookbook. Sixty-six comps later, we had an approved cover infused with pink, orange, and gold. 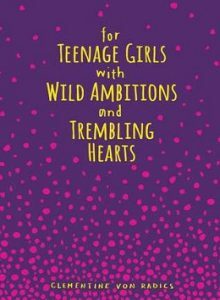 For Teenage Girls with Wild Ambitions and Trembling Hearts had its share of obstacles. It was a single poem created to inspire teenage girls to set the world on fire and trust themselves, by Clementine Von Radics. The cover design approval came along quite quickly, but the printing and production put our production coordinator in a tizzy. It was a hardcover book with purple cloth, stained yellow edges, and two foils on the cover: pink and a matte yellow. When we received a sample from the printer, the pink foil wouldn’t stick to the cloth, the yellow foil filled in the type, and the sticker with the barcode pulled the foil off once it was removed. Our solution: Put glue under the pink foil, print two hits of a PMS yellow instead of using a matte foil, and use a less tacky sticker for the barcode. We thought the problem was solved. The books were printed, the advances looked great, but the barcode stickers fell right off. Our final (and successful) solution: print the barcode on a belly band wrapped vertically around the back of the book. As far as advice for independent publishers, I would say to get the most out of design, you need to hire professionals. With design software being so accessible and user-friendly, some people may think they can save money and create their own books. Book designers have to take a lot of information and make it easily digestible for the consumer. There is an art to it. The package needs to grab the consumer’s attention, accurately reflect the content, and ultimately feel good in your hands. That comes with experience in this field and having thick skin, because everyone has an opinion. 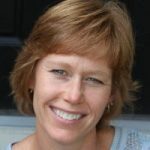 Julie Barnes is the senior art director at Andrews McMeel Publishing, where she has worked for the past 19 years. Before that, she was the art director at Russell Stover Candies and a graphic designer at Blick Benest and Company.